If you have been reading this blog regularly, than you know my love of Chinglish – funny translations of Chinese into less than grammatical/Nonsensical English. You also know that I collect instances of Chinglish, and that I mean no disrespect. I’ve hit the motherlode of not only Chinglish, but funny English from all over the world – Engrish! Marxism brand coffee – God’s favored coffee. 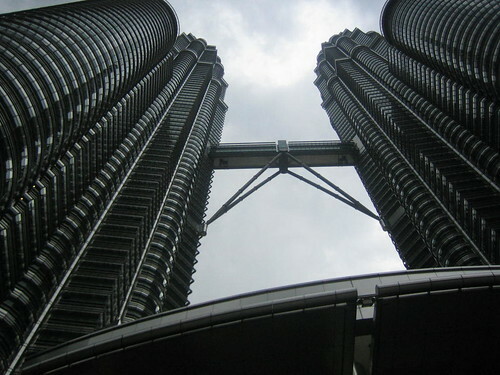 The beautiful Petronas Towers, no longer the tallest buildings in the world, but still very interesting architecture. They form a 5 point star, representing the 5 pillars of Islam. 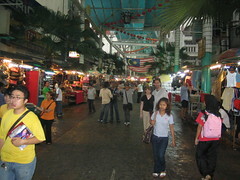 In KL we meant to explore Chinatown, looking for shopping bargains. 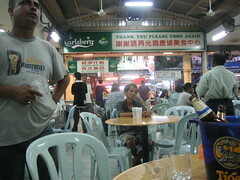 Instead, we sat in this food court, drank Tiger beers and waited for a break in the rain. After KL, we visited Langkawi Island. The first night we stayed in a nice beach chalet, the second in a more economical hostel. 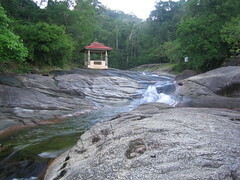 One of the places we visited is 7 Wells, natural pools formed by a river. 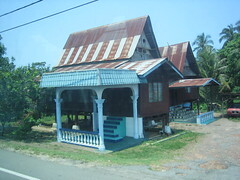 Here is a photo of some interesting architecture found around Melaka, in the Southwest of Malaysia. 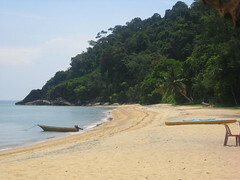 Our last destination was Tioman Island – a practically deserted island dream! Nipah Village is only accessible via the water, there are no roads. It was quiet, peaceful and relaxing. 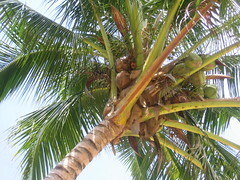 There is excellent snorkeling off in both directions, as well as great food. 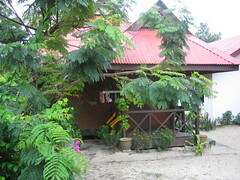 More of a shack than a resort, but what more do you need when you are already in a natural paradise? I wish I had photos of the underwater life. Snorkeling there is like jumping into the aquariums at Seaworld. Utterly incredible. The seabed is alive with all kinds of coral, thousands of colorful tropical fish and even reef sharks. Nemo? Found him, and all of his brothers and sisters, too. I’ve never seen anything like it. If you ever find yourself in want of a holiday in an interesting and exotic locale, why not choose Malaysia? It is, as they say, Truly Asia. Grrrrr….. All I wanted was some coffee. Just some boiling hot water so I could mix up a nescafe. Boiling water is ubiquitous in China. It’s the one thing you can always count on. Not today. A few months ago the hotel distributed handy little electric kettles. I already shared my creative use of the kettle – boiling eggs. Well, today I decided to use it for it’s true purpose. Seems that using an electric kettle saps a great deal of electrical energy and it ended up blowing all the power outlets in our room. Nice. Then, when I went to try to find some hot water in the giant hot water heaters they have on every floor – they are all turned off. So now I have to try to explain to the maintenance people that our power outlets don’t work, and they need to be fixed. (I’m almost out of phone battery, laptop battery, etc…) Usually not a big deal, but in China, the littlest thing can be a big deal. In a few weeks my mother, my sister and my sister-in-law will be visiting me here in China. I was trying to email them all to give them a little info on what to expect when they land in Beijing and make their way across this great country. Well, hotmail is not cooperating, not in China, not this week. So I thought I could just post here on the blog, besides some of you out there thinking of visiting China might find it helpful. The pictures from Malaysia, you ask? Still on the camera. Too lazy to download them… Maybe this weekend. What to expect while visiting China? First – get used to it right away, you are going to be stared at. Constantly. Well, maybe not constantly if you are in a city like Beijing or Shanghai. They are used to foreigners. Everywhere else, you will be the days’ entertainment. Random people will tell you hello, usually from a safe distance, and then roar with laughter if you reply, “hello.” This staring is not malicious, just curious. Eventually you will not even notice it. Remember, there is no such thing as privacy in China so feel free to pick your nose or whatever while people stare at you. Speaking of privacy… it is also quite common to hawk a big nasty loogie and spit it on the ground, wherever you are. So get used to it. 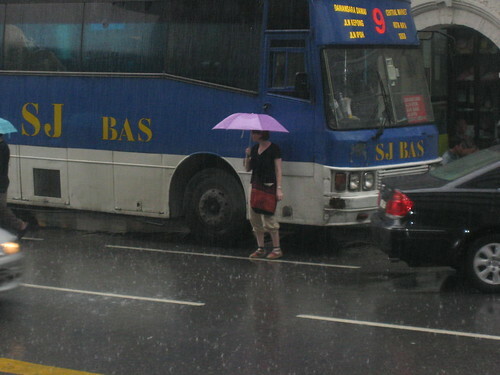 The government discourages this in Beijing, but that doesn’t stop the spitting. It’s been known to happen in restaurants. Also, the occasional emptying of the nose directly onto the ground is quite popular, especially among the elderly set. Speaking of restaurants… If you are seated, having a meal, and a Chinese person yells out “Fuwuyuan” loudly, and the waitress comes scurrying over, don’t get indignant and think, “how rude.” That is just how you call the waitress over. Also, when you are ordering, the waitress will stand next to you with a pad and paper and she won’t go away until you order. None of that handing out menus and disappearing while you decide. The food will come out as soon as it is cooked, and will be placed in the middle of the table to eat. So if you order something as an appetizer, it will usually come out last. Eating is communal. Don’t be surprised if something that you think should be salty tastes sweet. And don’t order the cake. Oh, and we don’t tip here, either. Ever. Sooner or later you’re gonna have to visit the loo. You can ask for the toilet or the WC in English, usually you will be understood. You may regret this decision, however. Chinese toilets are nasty. Not all of them, but most of them. Grand hotels and McDonalds generally have nice, acceptable toilets. Most of the toilets I’ve come across are squatters. You’re just gonna have to come to terms with that and accept the squatter. It really isn’t that bad. Don’t put toilet paper into a squatter. Don’t put toilet paper into most Chinese toilets. (Most likely there won’t be any paper there anyway.) Always, always, come prepared with your own paper. It is a really easy thing to buy here. They sale little tissue packets everywhere. Some of the most vile smells I have ever experienced in my life have been in Chinese bathrooms. Awwww… the smells of China. I’ve said it before and I will say it again. During your stay in China you will experience weird smells. Sometimes it is just chemicals in the air. Sometimes it is fertilizer, the natural, animal produced kind. Sometimes it is the smell of an open-air market. Sometimes it is trash. Sometimes it is just plain funky and unidentifiable. Try to speak Chinese, if you desire. Say Xie Xie for Thank You. Venture off into ordering dishes or asking for salt, whatever you like. Don’t expect anyone to understand you. They probably won’t. But they will compliment you on your excellent command of Xie Xie. You HAVE to bargain at markets. You HAVE to. Even if you don’t like bargaining. Just offer ’em 50% of whatever they tell you (or 20% or 30%, whatever you feel like paying.) Then walk away. Prices in the markets are marked up like a thousand percent. Chinese loooooooooovvvvveeeeeeee to say to the next Chinese guy “I got this foreigner to pay $5 for this $1 shirt. hahahhahahhahahahha” Bargaining is fun. You will be amazed that everything is much more modern than you expected. You will see all kinds of new cars on the highways and streets, especially volkswagons and audis. Beware the cars. Be a very wary pedestrian. The cars don’t stop for pedestrians. There are cross-walks painted everywhere but no one obeys them, except for one time when I was at Tienanmen Square some cars stopped so I could walk by and I didn’t know what to do. I was flabbergasted. Traffic is crazy. 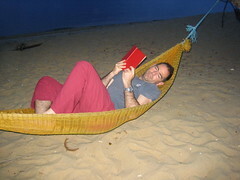 Sometimes it is better just to close your eyes and pray your travel insurance is paid up. Speaking of Tienanmen Square, pay no attention to the young kids trying to get you to go to an art gallery. They just want to take you to their cousin’s lousy art school show. And try to get you to fork over money for a paining of a Mongolian horse. If you can see blue sky in Beijing, thank your lucky stars. If you have asthma, bring extra inhalers. On a positive note, you will see some fascinating things, eat some great food, experience history and have a great time. After a journey home, over 24 hours, and a few days back here in Shijiazhuang, I am finally recovered from travel. This is why I think it is better to just terminally stay on vacation – because then you never have to recover from your transit travel. My last post said that I was in Mersing, waiting for a bus to Kuala Lumpur. Let me tell you about my 24 hour journey home. It started earlier that day on the island of Tioman – at 5PM we took a speed boat to Mersing, one hour. From Mersing, we took a bus to Kuala Lumpur – 6 hours. At 5AM we arrived in KL and then took a one hour taxi ride to the airport. At 8AM we flew from KL to Shenzhen, China, which was 4 hours. Then we took a 3 hour plane ride to Beijing. Then an hour and a half across Beijing rush hour traffic in a taxi to the train station. Then a 3 hour train ride to Shijiazhuang. Then a 45 minute taxi ride to the airport hotel, where we live. 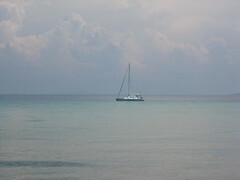 We left Tioman at 5PM on Saturday. We arrived home at 11PM on Sunday night. Phewwww. Just a quick update from Mersing, a small city on the Southeast coast of Malaysia. 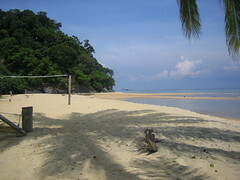 We’ve just arrived here after 4 days on “Bali Hai” aka Tioman, and all I have to say is that it was paradise. I will fill you in all the details upon my return to SJZ. Unlike Dorothy, I do not want to go home! Hello from Melaka! Right now I am in the bus station, waiting a few hours for my bus ride to the East coast. Melaka is hot, but amazingly, it hasn’t yet rained. The city is fairly small and full of colonial architecture that is very interesting. There are a lot of Chinese here, and so it is slightly comforting to be able to understand a few words here and there spoken by the locals. Not to worry about communication, though because just about everyone here speaks English. 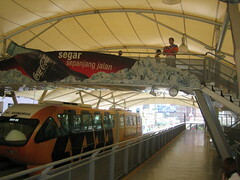 Regularly you will hear Mandarin Chinese, English, Malay, Punjabi and probably a couple more languages, too. I know I already said it, but I am so impressed with the cultural diversity here. Of course I stick out like a sore thumb with my pale skin, freckles and red hair, but I get stared at much less here than in China. I am so oblivious to it by now, though, that I may not realize whether people are staring or not. Sunday evening in Langkawi I was talked into renting a moto and going for a tour of the island. It turned out to be a lot of fun because we got to see quite a lot of the island. It is no Koh Chang (Thailand), but it certainly has some amazing tropical rain forests. The beaches are okay, but nothing like I expected. (We were there during the off season, though, so it may be much better in the coming months.) There are many resorts all along the coast, which are very nice looking and probably have better beaches, but as resorts usually are, these are off-limits unless you are staying there. So, I would recommend the place if you are the all-inclusive resort type. Unfortunately, we are not. On our bike ride, we stopped off at a place called “7 Wells” where there are 7 natural pools formed by a small river flowing down off a mountain. Eventually, the water plunges over a marble cliff and forms a huge waterfall. I am sure years ago it was amazing, but one of the resorts set up a huge water pipe to drain some of the water off the river and now it is much smaller than it was before. The highlight of the trip was observing a family of monkeys. (Seeing monkeys always makes me happy!) Unfortunately, they were monkeying around in the trash dump of a nearby resort. I guess you can tell what I think of resorts. I also read that Langkawi was hit by the boxing day tsunami of 2004, but was very fortunate to escape serious damage and death. In fact, only one person was killed. Much of the Western part of the island suffered water damage and flooding, but since the waves had already hit Indonesia and had to curve around a bit to hit Langkawi, they were travelling at only 160 km/hr. Honestly, the only evidence we could see was a memorial set up at one of the hotels, made up of a bent, twisted beach chair mounted on a granite base. There was also a hotel complex that seemed to be abandoned, perhaps from water damage. Malaysia’s death toll from the tsunami reached only 68. Very fortunate, indeed. Now that we are heading to a small island, I may not be updating this blog again until I return to SJZ on the 14th. The internet connection on Langkawi was painfully slow, so if there is internet on Tioman, I expect it to be practically prehistoric! No, I’m not turning into the Wicked Witch…not yet anyway. Instead, I am in the hot and humid country of Malaysia. I don’t think that I was built for this kind of heat, but I am enjoying it anyway. What can I say about Malaysia? So far we have spent two days in Kuala Lumpur and two on the island of Langkawi, on the West coast very near the Thai border. It has rained everyday, and when not raining, it might as well be. My impression of KL? I am so enchanted by it. I love the colors, the humidity (it does amazing things for the skin), the architecture and all the tropical decay. Also, the fact that it is a city, but it is so full of palms and trees and flowers and green everywhere. The food is incredibly fresh and varied. It is like being in China, India, and tropical Asia all at once, with its different cultural groups, the Chinese, Indians, Malays and Indigenous tribes, all living in seeming harmony. There are Muslims, Hindus, Buddhists, Christians and Indigenous Animinsts all living side by side. What is so spectacular is seeing their temples side by side, too. I love that you can see a hejabi (a muslim girl/woman who wears a headscarf) walking down the street beside a girl in a mini-skirt. I am sure that racism and religious intolerance exist here, as they do everywhere, but it was less evident to me. My love affair with KL waned only slightly after observing two healthy-looking rats chasing each other down an alleyway. This is the tropics after all. Anyway, now we are on a sleepy island where there is not too much to do and it is so hot that I just had to escape to this internet cafe to enjoy the A/C. Tomorrow we are heading down the West coast to the town of Melaka, which was a Portuguese colonial village. 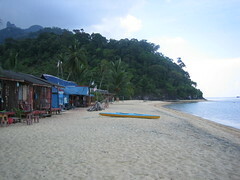 From there we will head to the East coast and the island of Tioman, where “South Pacific” was filmed…Bali Hai…. Awwwwww. Life is good…. More to come, hopefully with pics! I don’t realize how complacent I have become to many things in China that would be quite strange to me if I were still in the West. That is, until incidents happen like what occurred yesterday. After work, I was riding my bicycle back to the hotel when I approached a motorcycle, driving very slowly, in front of me. I was wondering why in the world he was driving so slowly – until I passed him. Looking to my right, I saw a baby – maybe 18 months – sitting on the seat in front of the driver. Actually, I would say that the baby was not so much sitting as attempting to crawl up the gas tank. The driver had one hand holding onto the belly of the babe. Why this is shocking to me is not because there was a small baby riding a motorcycle, with no helmet, no harness, no protection what so ever, but that as I passed by all I thought was, “How cute, look at that little baby.” That’s right. Not one thought of how dangerous the whole situation was. (I was back at the hotel by the time this realization hit me.) China is getting to me. Just to let everyone know, especially my parents and siblings, I have been having problems accessing hotmail for several days now, so I have not been able to email you all or answer your emails. So, don’t worry, I will email you as soon as hotmail becomes available again. Anyone else having this problem or is it just China? Posted in Uncategorized | Comments Off on No Hotmail!